A few miles from my dad's lake house (where we're visiting now) are the Tempel Lipizzan Stables which house Lipizzans, Europe's oldest domesticated horses, owned by the Tempel Smith family (of Tempel Steel). The grounds are incredible and we love going to see the shows. According to Lippizan.com, "Lipizzans are Europe's oldest domesticated breed of horse. They not only possess beauty and nobility, but also a rare combination of courage, strength, ability, temperament, and intelligence. The Lipizzan breed had its beginning in 1580"... and was created by a combination of different breeds... They have been moved throughout the past 400 years numerous times to survive various wars including the Napoleanic Wars, and World Wars I & II. "In 1945 General patton executed a daring rescue of the Lippizzans, the story of which is told in Disney's The Miracle of the White Stallions." "In 1955, millionaire Tempel Smith (Tempel Steel) of Chicago, imported 20 Lipizzans from Austria, 11 from Hungary, and 6 from Yugoslavia..."
..."Tempel Smith devoted 15 years, until his death in 1980, importing and breeding his herd to over 400 horses. Since Tempel Smith's death, much of the herd was disbursed. However, Tempel Farms still breeds a number of Lipizzans each year, and they still successfully compete Lipizzans for Tempel Farms." I can't believe how high they jump!!! ...And of course I can't see all of this and not start to think about interiors. Oh my gosh, please someone call me with a horse fetish!!! 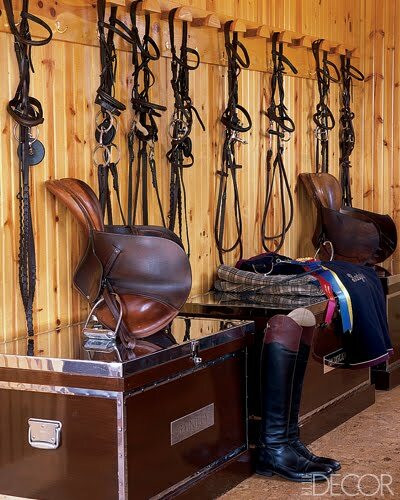 (err passion ;) I'm dying to do a home for a horse-lover now!! 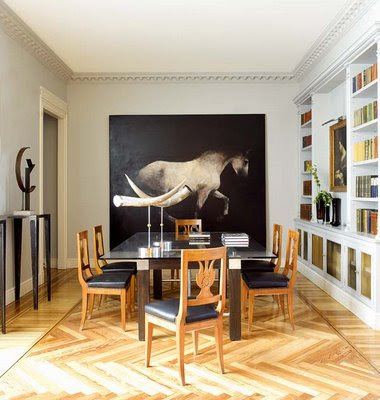 Check out these photos taken by Roger Davies for Elle Decor of Mark Badgley and James Mishcka’s home: Mmmmmm.. love it! I am living in Graz, Austria and the Piber Stud Farm where they breed these beautiful horses is like 25 minutes away. I have yet to go...I must now! And they still have shows around Vienna here. Beautiful pictures. What a gorgeous post! I loved the images you captured. So alive and inspiring. Thank you for a great start to the day! Those horses are beautiful! I always want to go to the traveling show that comes to town around Christmas but haven't yet. After seeing this post, I might have to do it this year! I can't get enough of equestrian style, and the boys look like they're having so much fun (my son loves horses, too). Ah, this was a stunning post. I'm so not a horse person...I mean, I like looking at them from afar, but I can't ride to save my life. Great post and a fun diversion!! Stunning place and beautiful horses! Your boys look like they really enjoyed it! You know I love you, and this post, but Lauren, you need to go back and ask to see the guest house. great photos! I love seeing all of these little jewels that I wouldn't otherwise know about. One only has to gaze upon or see a performance of these magnificent beasts to understand why the legends of the Unicorn and Pegasus exist. Great post. You actually live so close to the mecca of the horse world, Middleburg, VA. Have you ever been. It doesn't get more horsey than that. Miles and miles of old, gorgeous farms belonging to the likes of the Firestones, Jaquie Mars of M&M Mars, the Kodak Family, DuPont's and many, many more. You need to get a few contacts over there and go to town. Things just seem so perfect there, don't they! Asolutely beautiful post! Now that is a place I would LOVE to visit! 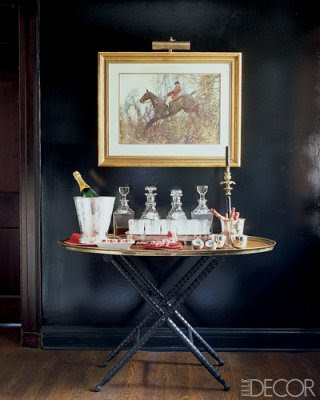 Those horses are beautiful, and equestrian style is so timeless! Gorgeous photos! What a surreal, grand place to visit! I'm a new follower - found you over at The Life of a Future Domestic Goddess. So glad I found your blog - you have great style and such a fun way of sharing! What a great post! I am a life-long horse owner and live on a farm in NC with horses, gosts, chickens, dogs, and cats. I love to surround myself with art and artifacts that remind me of my animals from drawings of my horses, "bouquets" of chicken feathers, shadowboxed horse show ribbons, and even abandoned bird;s nests made entirely of my horses hair. I also collect paintings of barns and display them in my tack room and in the house. I really feel my farm represents me and my family without becoming too much of a "theme." I have visited the Spanish Riding School in Vienna but had not heard of the farm you visited. Beautiful! I wish I could potty train my chickens and teach my horses not to blow their noses on the walls! Thanks so much! your photography is gorgeous in this post...I would take an evil look from a rider to capture that moment:) and the woman oh the horse, gorg! We have seen the Lippizans here in Aiken, South Carolina. AMAZING! Also, so into Equestrian Chic these days myself. Gorgeous grounds, and horses! I love the brick herringbone in the bathing room in addition to the stables and everything else! Enjoy your vacation! Nothing like a horse of course to inspire one. I love drawing them too. My goodness everything is so beautiful. The houses and horses are breathtaking. I just found your blog and love it! BTW, I have a giveaway over at my blog http://aspoonfulofdish.blogspot.com, come on over and check it out. The horses live in bigger digs then I do but the stables are stunning! I wonder if the horses would like a roommate? I wouldn’t take up much room just one stall. The horses are gorgeous and huge and OMG I didn’t know a horse would jump like that….look at his poise! You can see the muscles in his hind flank. I don’t own horses but live around a lot of them and while they’re beautiful they are nothing like these Lipizzans. What a real treat for your family and us, thank you so much for sharing. I adore horses....and grew up riding Western (you know, the whole Texas thing). But, I think there is something so graceful about more proper equestrian style. 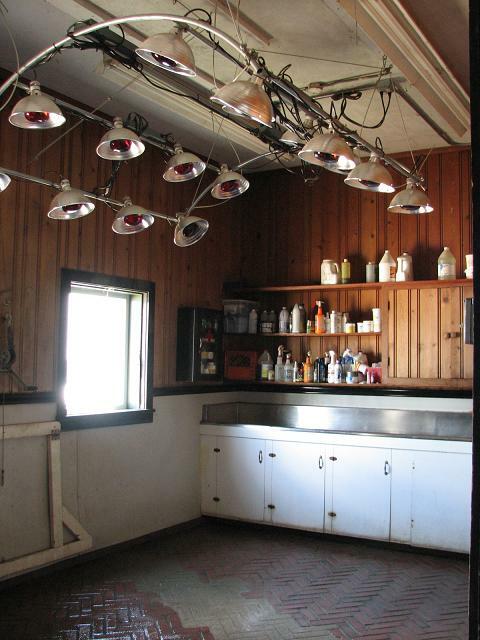 And I adore stables. Your photos are beautiful -- and I can tell how much fun your family has attending the shows! 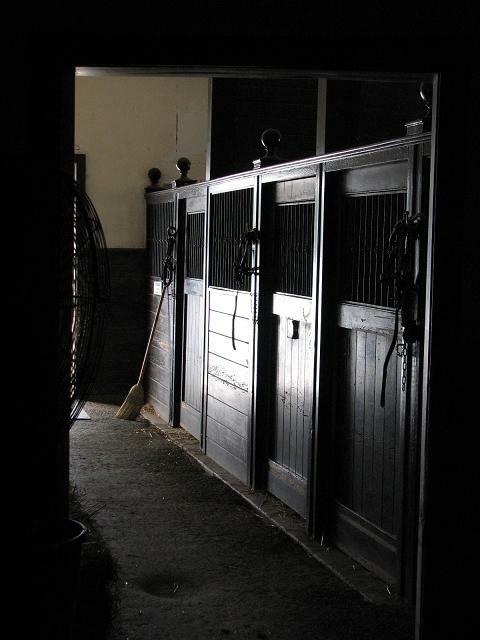 That is one of the most beautiful stables I have ever seen!!! I've been in awe of those horses for as long as I can remember. love these photos... such a dreamy place to live in! The ribbons are all from the 50's isn't it amazing???? These are amazing amimals. My daughter is a horse lover (she rides saddle seat) and has spent hours reading and watching the Lipizzans. Great post and beautiful pics. And your children are adorable! Holy amazing post! Some of your photos of the grounds and jumping horses are just amazing. Like I would like to frame them! And I love that you got caught. Where are the Stables located?? Beautiful! thank you! Hi! I've been a lurker for several months, (though I commented about the willow trees; how are those coming along, by the way?)... Anyway, just loved this post and wanted to tell you. Also, in that photo of Christian in the fire truck, he looks SO much like you! Smiles. I have a crazy obsession with horses and equestrian design...love it all! OMG this is one of my most favourite posts ever. I loved everything about it - the stories, the photos and the inspiration. Is that a horse doing a Capote up there? If so, amazing! Something I'd imagine seeing at the Spanish riding school! The horses are splendid creatures, but my favorite shots were of your adorable boys. That Justin in his jaunty hat showing his bottom teeth...priceless.